Here’s another ad that Glen sent me. From Colliers Magazine, 6 September 1946 advertising the “Alexander the Great” pencil. Some of the text reads “Start school with an ‘A’. ‘A’ for Alexander the Great pencil for only $1. The only all metal pencil with Long thin leads, ‘Big Inch’ adjustable eraser, Spring-steel gold plated clip” Later on we are advised to ask to also see the Commentator pen & pencil set $8.75 (no luxury tax) and the Imperator pencil $5 (plus luxury tax), which are also available in leading Canadian stores at slightly higher prices. Poor old Canadians have to pay extra. Alexander pens…pencils ‘write around the world’. I hadn’t previously heard of the Alexander Manufacturing Co. Bloomington, Illinois. 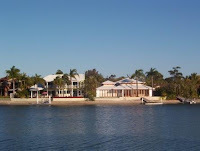 If you are an old-time US tax expert then tell us about "luxury tax". I suppose that depending on your marketing plan, attracting luxury tax might be a good thing. Imagine the insult of Mont Blanc or Cartier producing a fancy pencil that wasn't eligible for luxury tax. The Grip Plus is a 0.7mm “Made in Japan” pencil that Faber-Castell offer worldwide. It comes in four different body colours, but only in 0.7mm lead, presumably as part of Faber-Castells assertion that the general public prefer 0.7mm lead due to breakages with 0.5mm leads. It is arguably Faber-Castells flagship pencil, as it’s the featured pencil on their websites mechanical pencil main page. I have always found the name ‘Grip Plus’ a little confusing as they also have the Grip 2011 pencil. The Grip Plus has two prominent features – the grip as implied by its name, and its eraser. Firstly, let’s deal with the grip. The grip is a triangular rubber section. The section narrows slightly towards the tip, before flaring out at the bottom and stopping your fingers going any lower down. The compound is fairly hard with only minimal give under normal finger pressure. There are horizontal grooves cut into the rubber which definitely do further enhance the grip. Overall it’s reasonably successful. I imagine this grip would score fairly well in a test poll of the general public. Next then we have the eraser. It appears to be a vinyl compound, about 7mm diameter and 27mm long, and is mounted in a fairly standard screw cartridge. I must admit that the screw out eraser is a welcome distraction in a boring business meeting! Twist out, twist in, twist out, twist in...how much longer is this going to drag on? 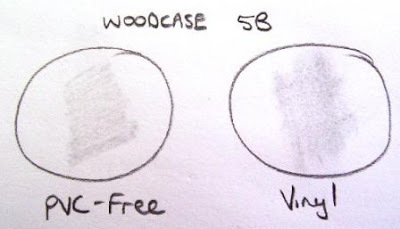 The eraser compound is fairly good, erasing about as well as you would expect of a vinyl eraser. 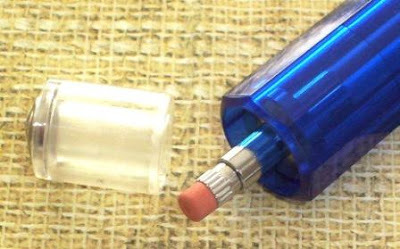 You pull the entire eraser cartridge out to access the lead refill chamber underneath. The lead advance mechanism is a standard push top ratchet, 10 clicks advances 7mm of lead. The tip is a small cone so it’s suitable for general writing but not draughting. It is retractable for pocket safety. The lead is spring loaded to further reduce breakages. Some spring loaded or cushioned leads are rather hard to notice, but this one you can really feel the cushioning as you write. Overall, this is a very smooth-writing pencil. Personally I don’t really like the look of this pencil, but it feels OK in the hand and writes well. As I mentioned above, I imagine it would do fairly well in a test against similar competition. Best Points – Good cushioning to the lead, good eraser cartridge. 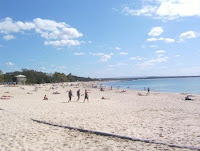 Not So Good Points – Well, not much really, except personally I just don’t like the look of it. Dimensions – Length 139mm, diameter 13mm body. Balance point about 65mm up from the tip. Here’s a real mini pencil. Only 65mm (2 ½ in.) long, plus a little tassel cord. I suspect it was marketed as a golf pencil back in the 1960’s or so. You twist the metal tip to advance or retract the lead. All good things must come to end. Just like my holiday finished, this is the last of my holiday mini-pencil reviews. The End - but I have saved the best for last. The Ohto Tasche SP-10T is a great pencil. First off, it looks great. With the cap on for storage, it looks compact and “useful”. Small, but not too small. Mine is a glossy dark blue colour and the strategically positioned chrome trims combine with the blue and the overall shape to produce a really great look. Opened up, with the cap posted and ready for writing it looks equally good. Stylish but purely functional. Closed up, the Tasche is small enough to fit in most compendiums or pocketbooks. The cap system means it is totally pocket safe, and the tip is protected from any accidental damage. The pocket clip is spring loaded and is a good solid piece, not much chance of accidentally coming off whatever you clipped it to. The Tasche has a 3mm fixed lead sleeve. Combined with 0.5mm lead size, it’s actually useable as a technical draughting pencil. Equally though it’s suitable for general writing. The grip area has no special grip enhancements. Like the rest of the pencil it is metal, but the grip section is finished with a lustrous but non-glossy finish to slightly enhance the grip characteristics. However, it’s still essentially a plain metal body so the grip will never get an “excellent” rating. The end-cap on the body is a chrome plated screw in cap. You unscrew it to expose a small eraser, and pull the eraser to access the lead refill magazine. This is all a little bit time consuming. The eraser is definitely emergency use only. I can see the end cap rolling around the floor of the train to Brussels or the flight to LA if you were using the eraser regularly on your travels. The end-cap also has a black rubber o-ring set into it. When you post the cap onto the body to get ready to write, the o-ring guides the cap onto body and holds it there. I really the like the pneumatic, compressed air feeling as you slide the cap on or off the body. It’s like my own little piston toy – a silly, secret, little something for the engineers amongst us. Once posted, the cap is free to spin around on the body, which sometimes I like, and other times I don’t. You can actually use the pencil with the cap unposted, but in that case it is definitely a short pencil. The lead advance mechanism is an ordinary push top ratchet mechanism. 10 clicks advances 7mm of lead. Putting the cap back on the tip to close up for the day generally activates the lead advance mechanism unless you are careful. This always annoys me. Now, I must tell the truth and say that I had a problem with the mechanism of my Tasche. The lead stopped advancing. I have a shockingly poor success rate at disassembling my pencils, they never seem to work as well after I have opened them up for “investigation”. So these days I resist temptation and only pull them apart when absolutely necessary. In this case the “lead retainer” had come loose in the tip and I managed to push it back home into position and everything was once again as it should be, so that made me feel happy. Best Points – Looks good, like the cap system. Not So Good Points – I would feel “picky” to list anything of consequence here. 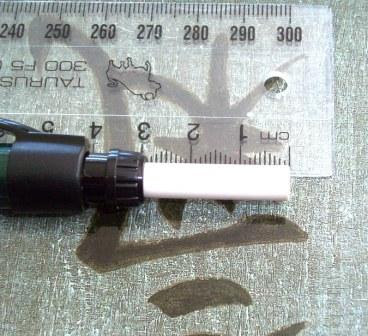 Dimensions – With cap on front in storage position = 107mm long. With cap posted on top for writing = 139mm long. With the cap left off (unposted) = 104mm. Diameter = 8mm at grip. Balance point about 75mm up from the tip with cap posted on top for writing. My final comment - I thoroughly recommend Ohto Tasche to you all, it is a worthy competitor to Pentel Sharp Kerry. Another poll, another 268 votes?! Astonishing. 268 votes cast in this poll, exactly the same number as cast in the preceding lead diameter poll. With 35 % of the vote, HB is the preferred lead grade of readers of this blog. I can’t imagine that surprising anyone. I did expect B and 2B to score rather well, but perhaps not quite as well as they did - I expected a fairly good tail, but it was more substantial than I thought. I guess this reflects use by artists and many general writers wanting a good dark solid line. The hard grades did better than I thought too, even though they remain far less popular choices. Combining the results of the lead diameter and grade polls together in a completely unscientific way, winner with winner, second with second, etc produces this – the most popular lead is 0.5mm HB, second most popular is 0.7mm 2B, and third is 0.9mm B. That’s actually not that crazy a result. This simple black and white advertisement is from the UK magazine “John Bull”, 20 November 1954. This ad always looks upside down to me – to my eyes the hand and pencil should be pointing downwards not up. The text reads “The Gift For HER”, “The pencil that contains one yard of lead”, “Prices from 18’10 inc P.T”, “Yard-O-Led”, “Made in England and available from leading Jewellers, Stationers and Stores throughout the country.” For those not familiar with YOL pencils, the name comes from the fact that they are loaded with 1 yard (0.91m) of lead, usually as 12 x 3 inch leads. The ladies models are often referred to as Yard-O-Ledettes. Here’s an advertisement from Esquire magazine, July 1947, USA edition. $5 for the 12K gold filled Cross pencil, which I think is a Cross Classic Century. These days the Cross website advertises a 14K rose gold filled Classic Century for $80 or a 10K “ordinary” gold filled for $55. The headline text is “For Dad’s Big Day” and the lower textbox reads, “Years haven’t dimmed Dad’s appreciation of lines that are trim and slim. He’ll be strong for the balanced slenderness of this streamlined beauty.” Well either I’ve got an over-active imagination or this ad is chock full of innuendo. Let’s just hope that all this strength and appreciation of trim and slim lines is conducted in an appropriate way. Thanks to Glen for sending me the scan of this ad. I’ve been meaning to post some of my ads and other things for quite a while now, so expect a few more over the coming months. The second to last of my holiday mini pencils is the Kaweco. Many years ago, from the sound of the name Kaweco, I thought that they were a Japanese company. But then I did a little reading and discovered they were German. Actually I have always found it quite hard to find out much about Kaweco, other than the very basics of their history. Recently though, a reader from Germany vastly increased my meagre Kaweco knowledge by giving me the link to Gutberlet, the manufacturers of Kaweco. I hadn’t previously heard of Gutberlet, but it appears that basically they are a company somewhat similar to Schmidt, making writing instrument components and owning and manufacturing the Kaweco brand products. So “Koch, Weber & Co.”, hence “Kaweco”, were founded in 1883 in Heidelberg and by the early 1900’s had become a major manufacturer of fountain pens, often credited as the first German company to make a pen that really didn’t leak. Like many a famous old brand they ran into trouble and are now part of someone else. Right then, enough introductory rambling, onto the actual review. The Kaweco Sport has three versions – Classic, Ice and Bunt. Basically the combination of colour and lead size (0.7mm, 3.2mm or 5.6mm) determine the name of version, but they are all basically the same. Mine is a 0.7mm transparent blue pencil making it a Kaweco Sport Ice pencil. First things first, this pencil looks great! Short, chunky, octagonal body in a brilliant shiny deep blue transparent colour with metallic internals. Fantastic. As well as going on holiday with me, I also used this as my “pencil of the week”, and a few people at work remarked on it. It really stands out, all glossy and blue, just lying there on your desk - a beacon amongst the detritus of commerce. I hereby formally apologise to Gutberlet / Kaweco, my photos do not do justice to your product. There are no grip enhancements on the Sport so you can pretty much hold it anywhere on the body that you like. Overall the Sport might look great, but it’s just a fraction short for my liking, and it’s a bit too fat for me as well. The shiny smooth plastic body wouldn’t make for the best grip in the world, but the fatness helps with that. The shortness was a bit of an issue for me as the top edge of the body is a good sharp corner – not so comfortable when it rubs in between thumb and forefinger. The pencil is also quite a lot lighter than the short fat look might suggest. Having said all this, I did find it a perfect size for holding in my hand whilst banging away at the keyboard. You know, I wasn’t really having a good week, so me and Kaweco, we really taught that keyboard a lesson. Gave it a good beating. The mechanism is a standard push top ratchet. 10 clicks advances 8mm of lead. A metal “Kaweco” shield or crown is stuck on the top of the top button. I couldn’t help but think that there should be a novelty version as well – when you push the top button down a light comes on. I’m sure it would look good with the blue colour. The tip is non-retractable and only has a little short straight sleeve section at the end of the tip so it’s only for general writing, not draughting. Best Points – Great looks, interesting octagonal body. Not So Good Points – Not pocket safe, no pocket clip,…where does it go? Dimensions – Length 112mm, width 13mm across the flats of the octagon. Balance point about 60mm up from the tip. I also have this one too, Kaweco Sport Bunt, red 3.2mm clutch pencil. The red is opaque, not transparent like the "Ice" colours. Time to carry on broadening my eraser horizons. So, the Faber-Castell PVC-Free 7085-20 eraser was on special down at the store and I bought a two-pack. I don’t think I’ve ever really used a PVC-Free eraser before. Firstly, it’s a very soft compound, at least compared to something like the Staedtler Mars Plastic. Being a soft compound you really use a lot when you rub something out. It’s very smooth and easy on the paper. It is often cleaner and less smeary than a vinyl eraser because the compound comes off the eraser and rolls up into strands or blobs. 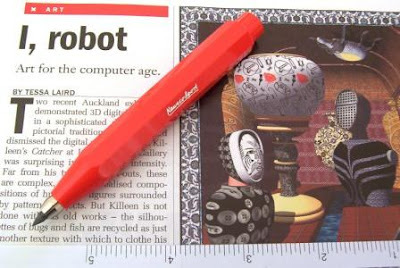 The 7085-20 is relatively normal sized eraser – 62mm long x 21mm wide x 11mm thick. It has a cardboard sleeve which slides smoothly down the eraser when wanted. It is made in Malaysia. The back of the packaging makes this statement – “Making life better for our young ones. Life is precious. Let’s give our young ones the best. Faber-Castell erasers are safe for children and unique in design.” Wow. Heavy stuff! Right then, enough of the advertising bumpf, time for some comparison tests against the Staedtler Mars Plastic vinyl eraser. Here’s the results. 1: With heavily applied HB lead - its close but the PVC-Free is better. 2: With lightly applied HB lead - its close but Mars Plastic is better. 1: With heavily applied HB lead - Mars Plastic is definitely better. The PVC-Free eraser leaves a noticeable light grey residue behind on the paper. 2: With lightly applied HB lead – it’s pretty much the same story, but the Mars Plastic was not quite so clearly better. 3: With normally applied 5B lead - PVC-Free is definitely better. The soft compound coming off the eraser means it doesn’t initially smear the graphite around, and overall it took more off. Certainly you notice how much easier on the paper the PVC-Free is. Overall then it’s a bit of a mixture, with PVC-Free better under some circumstances and not under others. I have certainly added the Faber-Castell PVC-Free eraser to my armoury. Just what exactly is “PVC-Free”? Nice to know it isn’t PVC (I suppose we should care), but what exactly is it made from? It’s very hard to find the answer. Most websites just imply it’s some sort of plastic, I assume some sort of TPR/TPE, but who knows? I’ve seen lots of ordinary rubber latex erasers labelled as PVC-Free. That’s obviously true, but rather than labelling themselves as “latex” or “natural rubber” they label themselves as what they are not, rather than what they are. What’s so bad about PVC that it’s good to be PVC-Free? PVC manufacture is often cited as being high up on the list of environmentally damaging industries so that’s one thing. But then when they label PVC-Free erasers as being “child-safe” that seems to be going a bit overboard. 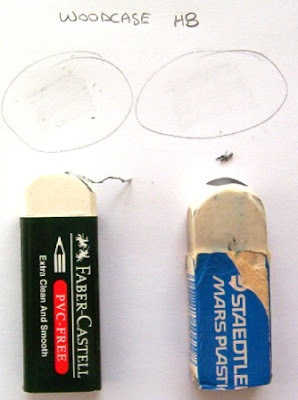 Are there common “child-unsafe” eraser materials? Latex allergy is far more common than PVC allergy, but latex erasers legitimately label themselves as PVC-Free. Diverting attention! 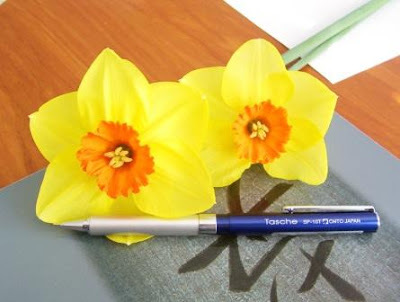 Today is the first day of the antipodean spring, the perfect time to post something about a spring pencil. So here it is – a Spring Pencil. A bit of an oldie. I picked it up cheap as part of a mixed lot of old pencils. There are no makers marks or any identifications at all that I can see. Like many oldies you twist the metal tip to advance or retract the lead. The spring is just an ordinary metal industrial steel spring – its got a few touches of surface rust. As you can see the main central section of the body is narrowed to form a post that the spring fits over, and then the end cap screws on to secure it in place.